A blend of 9 plant based digestive enzymes each having a specific action on food substrates that are consumed in the diet. It has 3 protein digesting enzymes including Alphagalactosidase which is beneficial in reducing gas. 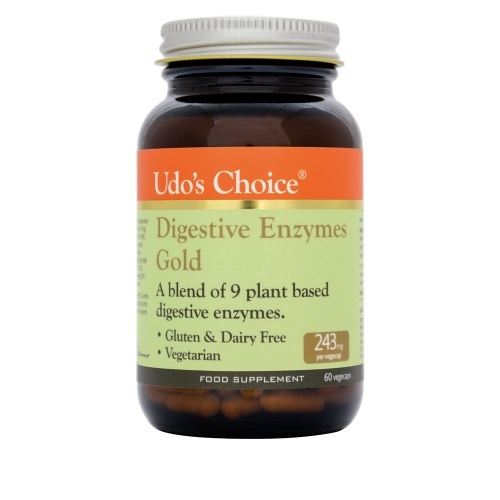 This makes Digestive Enzymes Gold particularly beneficial for people embarking on a plant based diet as well as those with chronic gut based issues. Ingredients (per capsule) Hypromellose (vegetarian capsule), Microcystalline, Alpha-Amylase 41.7mg (5000 FCC DU), Protease, 3.0 40.0mg (80 FCC SAP), Protease 4.5 37.5mg (30,000 FCC HUT), Lactase 37.5mg (3000 FCC ALU), Alpha-galactosidase 30.7mg (400 FCC GalU), Protease 6.0 20mg (10,000 FCC HUT), Bromelain 16.7mg (500,000 FCC PU), Lipase, 14.4mg (1500 FCC LU), Cellulase 4mg (275 FCC CU), Magnesium stearate, Maltodextrin.